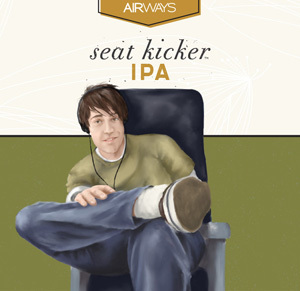 Seat Kicker joins the Sky Hag and Loud Lady in the Airways series of annoying airline-related characters. More than 24 pounds of Citra, Centennial, Simcoe, Columbus and Cascade hops are added to each 10-barrel batch of Seat Kicker. I’m a frequent traveler and as such have suffered long flights with a fidgety person behind me, doing a line dance on my lower back. Times like that I could use a stiff drink. The obnoxious passenger’s namesake presents with a sweet grapefruit and pine needle aroma. The thick, rocky white head atop the golden ale is a pleasure to look at. The taste is a little muddled, however, like listening to the captain as you hit 37,000 feet. You get the general idea, but it lacks clarity. Overall, if this was offered on my next flight, I’d gladly order two. A rich gold color with a slight haze, this perfumey IPA has an appealingly floral and faintly sweet citrus aroma, reminiscent of ripe pink grapefruit mixed with fresh lemon. The body has that same fragrant and slightly sweet quality in the front, but falls off in the middle to sharper lemon character with grapefruit rind accents, the latter of which continue through and indeed define the finish. While there is certainly nothing to fault here, the promise of the aroma is not borne out in this ale’s flavor.